A great beginner kit that is hot in looks. Previously sold in the 1469 Tandem-X Launch Set, you can now purchase one of our most requested rockets by itself. 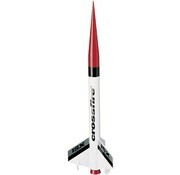 Powered by standard engines, this awesome rocket can go upwards of 1100 feet. Now that is high!